Hand polished glass shines like new. Glass repair technicians do not want you to know this, but anyone can polish glass and get impressive results with the right product. No special tools or training are required. All you need to make a dramatic improvement in the appearance of your automotive glass is the Diamondite Glasswork Kit for Hand Application. We have included in the Diamondite Glasswork Kit the applicators you need to clarify and polish glass by hand. A unique applicator sponge called the Zip Sponge gives Diamondite Glasswork Restorer the kick it needs to scour away water spots and mineral deposits, yet the small pores make it completely safe on glass. With the help of Diamondite Glasswork Cleansing Clay, Clay Lubricant, and Glasswork Shield, the Diamondite Glasswork Kit restores the clarity and smooth texture to windshields and windows. You won’t find a more effective glass polishing kit on the market for hand application. Clean the glass with Diamondite Perfect Vision Glass Cleaner and a soft microfiber towel. Pre-cleaning will prevent the Glasswork Cleansing Clay from becoming too soiled to perform properly. Apply a bead of Glasswork Restorer around the edge of the Zip Sponge. Use the Zip Sponge to spread the polish over a small area. Rub back and forth using light pressure. You may feel or hear the sponge grabbing the surface. This indicates that the honeycomb pores of the Zip Sponge are separating the mineral deposits from the glass. When Glasswork Restorer starts to dry, buff away the haze with the included Microfiber Waffle Weave Glass Towel. Continue in this manner until you’ve polished away all water spots. 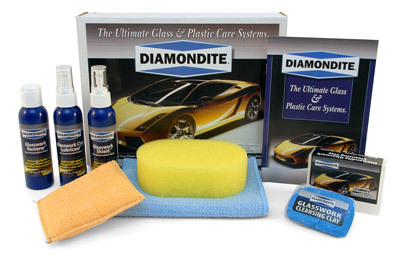 The Diamondite Glasswork Kit for Hand Application treats the glass on 3-4 vehicles.